South Africa’s President Jacob Zuma was on Friday evening conferred with a chieftaincy title in Owerri, Imo State. 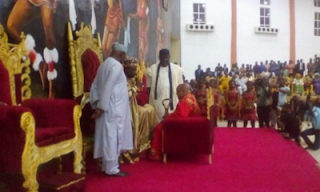 Zuma was given the traditional title of “Ochiagha Imo” by Eze Imo, HRH Samuel Ohiri. 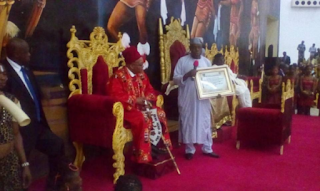 The chieftaincy title certificate was presented to him by former President of Nigeria, Chief Olusegun Obasanjo. ing a State visit to Zambia. Governor of the state, Rochas Okorocha revealed earlier that Zuma would also be signing a Memorandum of Understanding (MoU) between Rochas Okorocha Foundation and Zuma Foundation during the visit, Punch learnt.